Those of you who’d read my earlier post on exfoliation would have learnt about Cure, a product that I’d recommended for removal of dead skin cell by softening it and not through abrasion (as with scrubs). This, I find, is a safe product to use once to twice a week – though some reviews claim that you can use this more than once on the same day if you feel that your dead skin has not been completely removed (ie your skin still feel rough). Cure is made in Japan by Toyo Net Japan, and it is the company’s star product. You will see from the ingredient list below, that Water is the main ingredient for this peeling gel. There are, in the market, many peeling gels. In Asia, a popular peeling gel by Ginvera is one of the earliest form of peeling gel having dominated the asian market for more than 10 years. However, Cure remains different because it does not react just on any surface; and only turns into milky water when it comes into contact with dead skin. This is the point where one will gently rub to remove the softened dead skin. Activated hydrogen water from purified water is used. Widely used moisturizing ingredient that contains high hygroscopic nature and has been used for long time. The same liquid as used by ophthalmologists for eye surgery. We use it for thickener. It is to respond to old deadskin. Commonly used for conditioner. An expected ingredient that moisturizes and protects rough and dry skin. Extract from ginkgo, expected to moisturize, to prevent skin mottle and freckles. It has anti-inflammation and antibacterial effects and is expected to solve skin problems solutions. An ingredient contained in fruits, vegetables, and alcoholic drinks. Some of my friends had used Cure on their unwashed faces (ie. after removing makeup or if they don’t wear makeup, to use use it before washing their face). However, I realised that it is most effective when I use it after I have washed my face, without Clarisonic (note: Clarisonic have some abrasive effects – hence mild exfoliation). An important step thereafter is to dab dry my face (no water!) before I spread 2-3 pumps of Cure onto my face. I’ll leave it to ’emulsify’ (or turn ‘milky’) before I gently and softly run my fingers over my face to lift the softened dead skin. I will find lots of bits coming off my face. I will do this for about 1 minute before I rinse with cool or room temperature water to remove the bits. Once done, I will apply my usual toner and moisturizer to protect the new skin that was revealed. Another use for this product, is to remove long standing grim in hard to reach areas or under the necks, back of the knees, elbows, etc. It has been used on children below 12 years of age to remove grime that they did not wash off during shower – effective! Cure is widely available in Watsons in Singapore. This Japanese product is also available in Japan drugstores (I read this somewhere). In Singapore, it retail for about S$42 a bottle but one bottle can last you a few months. Users have to remember that once you open the bottle, you should finish it within a year (the effectiveness will weaken since it does not have the usual preservatives as the website claims). More than 5 years ago I was diagnosed by my doctor that the skin in my intimate area is prone folliculitis and other inflammatory conditions. This gives rise to swelling, itchiness, edema (in severe cases) etc. It didn’t help when I also have a very desk bound job that inhibits air circulation. During severe inflammatory conditions, my doctor will prescribe me with antiseptic wash and antibiotics. Several years later, a probiotic foam wash (which I will share in separate blog) from Taiwan that could help regulate the bacteria in intimate areas to help maintain its health. However, this probiotic product line could not address swelling and itchiness aside from the antibiotics that my doctor would prescribe. 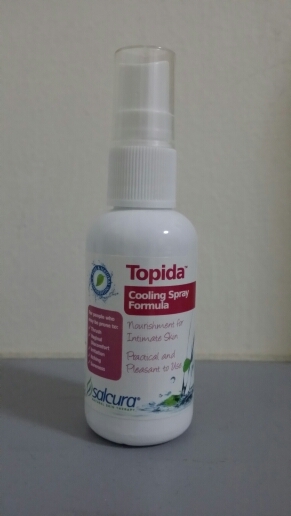 As such I found Salcura Topida Intimate Hygiene Spray, a product I found from UK that does not contain steroids, hormones, cortisons, peroxides, alcohol, parabens and antibiotics. This product is also not tested on animals. Salcura has many products ranges for selected skin conditions. The Topida “has been specifically formulated to soothe, cool and calm by creating a healthy microbial balance on the affected areas. This effective, quick acting solution balances the pH levels and essential nutrients help maintain skin cells and mucosa in a viable and healthy condition. The ingredients have been carefully chosen to provide all the nutrients for skin hygiene and comfort.” It contains Australian Sandalwood Oil, Cinnamon Oil, English Lavendar Essential Oil, Fennel Oil, Garlic Oil, Manuka Essential Oil, Neroli Essential Oil, Olive Fruit Oil, Paperbark Tea Tree Oil, Peppermint Essential Oil and Thyme Oil. This natural concoction helps to provide a cooling and antiseptic treatment for cases of itchiness, soreness, thrush, etc. However, one may feel slightly stingy when sprayed on the sensitive and inflammed / itchy skin followed by a cooling sensation. It was also mentioned on Salcura website that Topida is safe for those who are pregnant or are breast feeding. Now that’s good news! This product should only be used in mild condition – ie your itchiness or soreness should clear up in 1-2 days. Otherwise, you should quickly consult your gynaecologist or trusted family doctor to prescribe you with the appropriate drug. I usually use this when I feel slightly dry (indication of potential inflammation to come) or dull soreness / itch. It does give quite a lot of relieve and help to prevent further aggravation of the condition. Couple with the Taiwan probiotic intimate foam wash, I managed to stay away from the doctors’ clinic for about a year – without antibiotics or anti-inflammatory drugs. However, this can only be done if you are constantly aware of and are monitoring your condition regularly. Users are advised to shake the bottle before spraying the product just so that the oils will be well mixed together before application. Follow the instructions on the box and monitor your condition closely. Personal hygiene is also important. If you have tendencies to wear pantyliners, you should replace your pantyliners with those that allows better ventilation (cotton ones are the best) and change them regularly (ie everytime you visit the washroom) to ensure your skin comes in touch with clean liners all the time. 1) From Feelunique. They have limited range of Salcura but I have ordered the Topida from there. 2) From Salcura Official Website. They carry the entire range of Salcura products and they ship everywhere. I have not tried ordering from them yet. The Olio Essenziale Essential Oil by Biosmos was a product recommended to me by my beautician at Face Essensuals. This tea tree oil comes with a guarantee card that certifies that the tea tree oil is definitely safe (even if you were to consume it like what some users do with Young Living essential oils). I am not adventurous and has always been very careful with essential oils especially after reading about the potential side effects if they were not handled with care. Biosmos is an italian skin care product company set up by a beautician with many years of experience. I had used the Biosmos Aloe Vera Oxygenating Water with much satisfaction of its effects hence was not adverse to purchase another of its product. 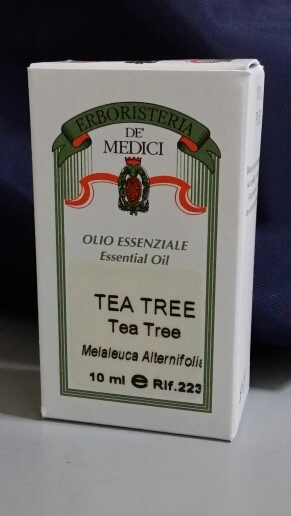 I had purchased this tea tree oil from Face Essensuals to apply on my acnes. Sometimes, when the skin acts up, I do end up with painful acne on my face that I want to seek quick relief. Though this oil does not give instant relief, it does help to bring down the redness and relief some painful sores from the inflammation. If you have mosquito bites, it can also help sooth the itch with its cooling effect. I have used other tea tree oils from Body Shop as well as Thursday Plantation – I still prefer to use this product because it feels thinner and is quickly absorbed by the skin. In fact, I’m on my second bottle of this product. When you open the fresh bottle, you will need to replace the bottle cap with the dropper that is provided in the box. To use, drop some of the tea tree oil on a cotton swap and apply directly on your skin e.g. acne, insect bites, etc. You will notice that the tea tree oil is very watery and to some extend looks like water. As tea tree oils are usually quite strong and known for some form of toxicity, I would stick with using cotton swaps just so that I would not accidentally touch my eyes when I still have product on my fingers. 2) If you are overseas, you can purchase online via the Biosmos Official Website. However, I would recommend that those based in Singapore purchase directly from Face Essensuals because the items sold at Biosmos website are priced in Euros and you will need to factor in the shipment costs which may turn out to be more expensive to purchase online. The website is billingual in Italian and English.